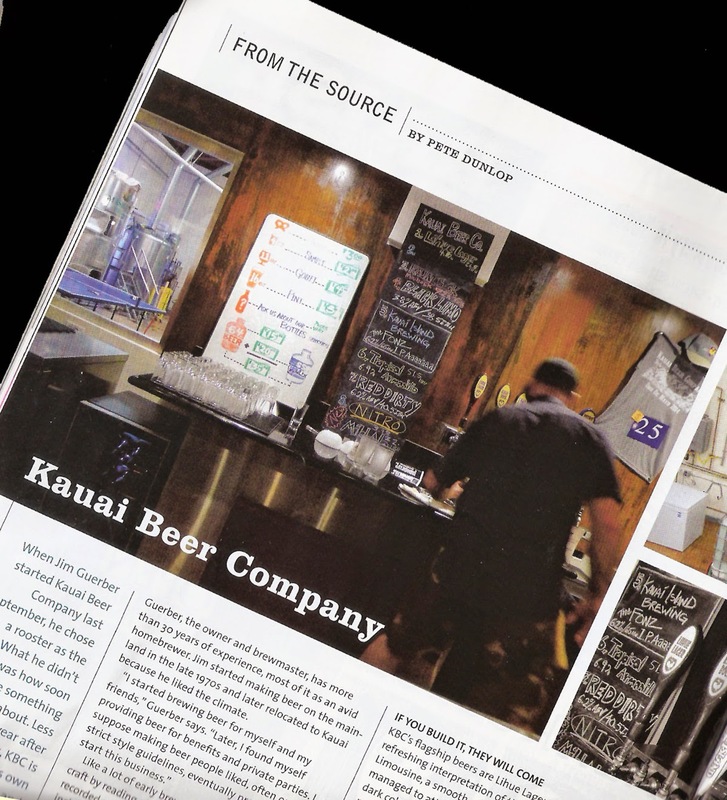 The current (August/September) issue of BeerAdvocate includes a piece I wrote about the Kauai Beer Company based on my May visit. There's almost no such thing as instant gratification in the world of publishing. This article was written and submitted in June. These things take a little time. 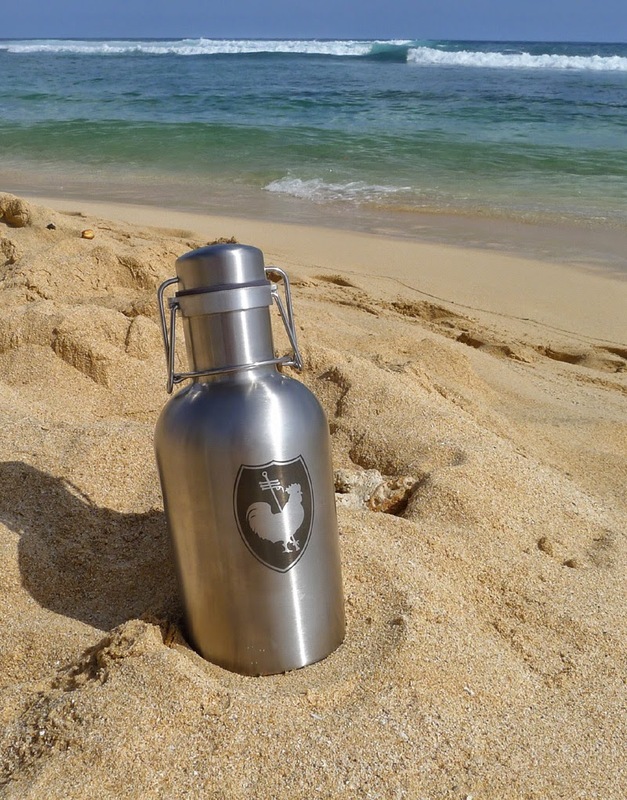 You may wish to seek out a copy of BA if you're interested in Kauai beer (sorry, there's no online version of the story). Due to the nature of print, a lot of dangling details didn't make it into the article. So I can share a few of those details here, where space isn't limited and the only editor that matters is me. Owner Jim Guerber is the driving force behind the KBC. He has been brewing beer since around the time homebrewing became legal in 1978. Not on Kauai, though. Jim was raised and attended schools in Pennsylvania. He passed through New York, Southern California and Northern California on his way to Kauai, where he arrived around 1996. How was he able to move around with apparent ease? Because Jim and his wife founded a software company, Signature Systems. It was no problem moving to NoCal or Kauai because they simply took the business with them. Jim's wife passed away several years ago, but he still runs the company with his son, Justin, also KBC's lead brewer. Jim operated an elaborate brewing setup in his home for many years. He was making so much beer that he eventually starting providing it to benefits and other causes. KBC's flagship brew, Black Limousine, was born when a brewing friend suggested a blend of Steinlager and Guinness. It worked and that beer has a strong following today. Finding a location for the brewery was one of the first challenges for Jim after he founded the company in 2011. He looked at warehouses and commercial spaces, and had his eye on a building previously occupied by a brewery. But the landlord had issues with the previous tenant and didn't want another brewery there. Breweries aren't always the best renters, apparently. 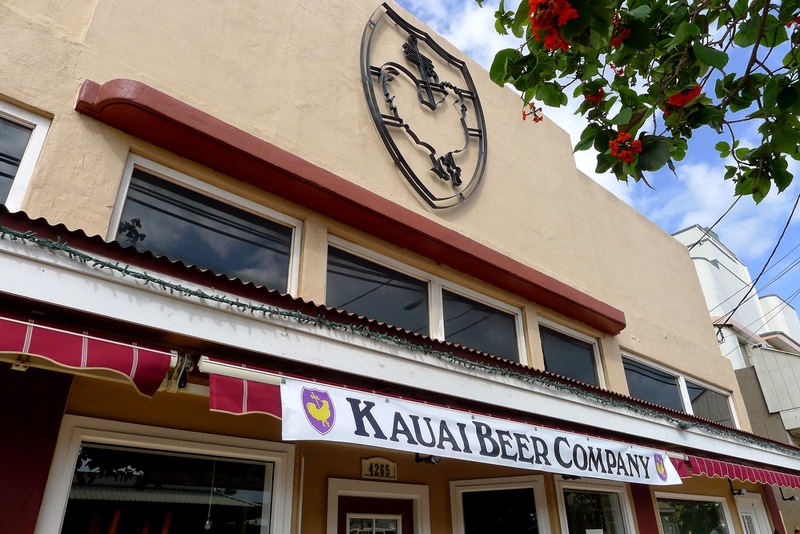 Jim eventually discovered and purchased the building where KBC now operates in Lihue, Kauai's county seat. It's a nice arrangement because there's no landlord to raise the rent or block necessary changes. When the brewery and tasting room opened last September, it was functional and that's about it. Even now, the space is in a constant state of evolution. It's worth nothing that KBC is not located in a fancy, upscale area. Like a lot of craft breweries dating back to the beginning, it lives in an old industrial area that time seemingly forgot. 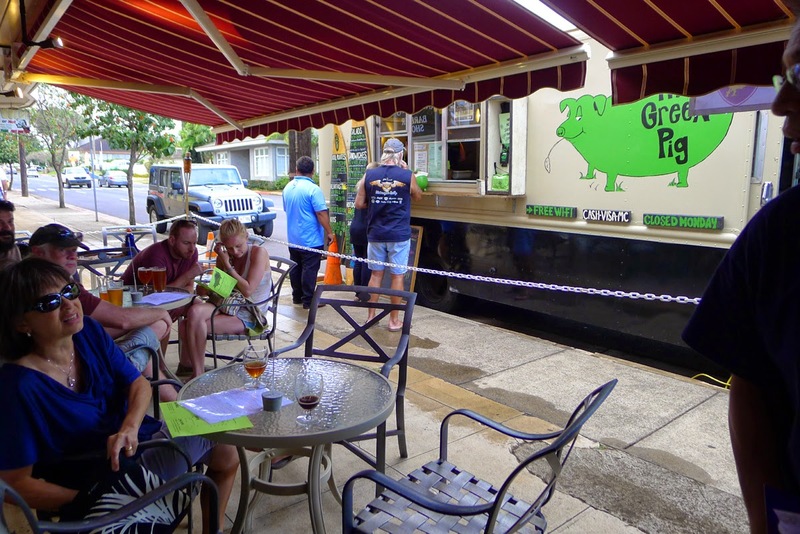 In fact, the KBC is one of a few businesses that is helping revitalize downtown Lihue after decades of decay set in motion by the collapse of the sugarcane industry. What they've done in a year here is impressive, given the circumstances. 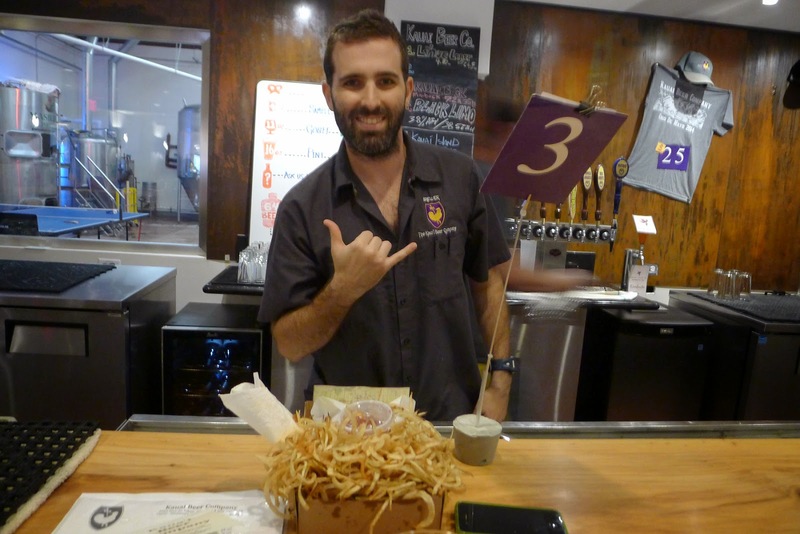 I won't go into details that are part of the article, but the bottom line is that operating a brewery anywhere in Hawaii is expensive and complicated. Jim are his crew are constantly looking for creative ways to manage costs and navigate Kauai's red tape. The evolution of KBC beers is an obvious point of interest. On my first visit in October 2013, lagers dominated the board. And nicely done lagers are a perfect fit in the tropics. Lihue Lager, their co-flagship with Black Limo, is a tasty beer with light tropical notes. It's quite popular. 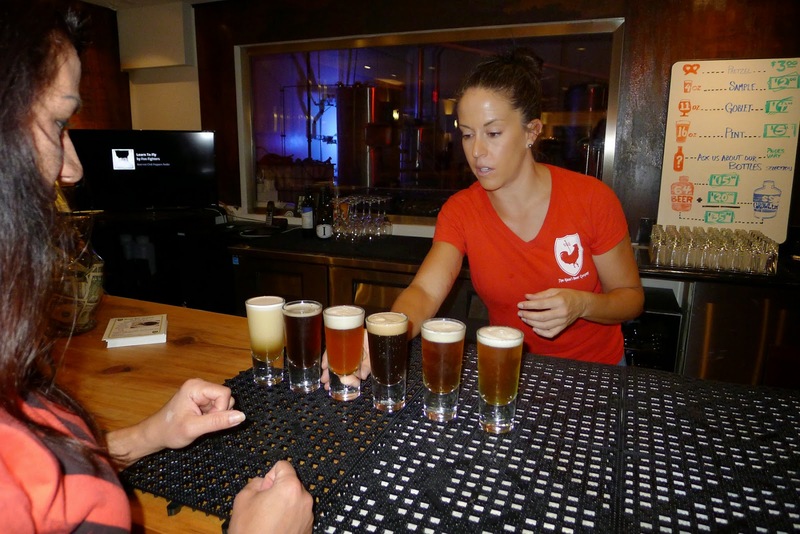 By the time I returned in May, the beer list had morphed and featured an IPA and other ales. "Customers asked for those beers," Jim told me, "and we enjoy brewing beers our customers want." There's also the fact that growing demand for the beer means they need to make it faster, which means lagers are a bit more problematic. Food was part of the KBC plan from the beginning. Jim envisioned an onsite kitchen and an island-influenced pub menu. But food took a backseat as they were getting the word out about the beer and building a clientele. The only food in sight back in October was a pot of chili. They were only open two days a week at the time. That's changing. The first thing they did on the food front was bring in food carts every Thursday evening. Truck Stop Thursday, as it is called, has been a huge success. The next step was to staff the kitchen and begin serving food on Friday...Finally Friday, they call it. They are in the process of expanding in-house food to Saturdays and will build the rest of the week out from there. What's happening here is crazy. They are attracting crowds to a space in a constant state of evolution, that still isn't open normal days and hours. And they are doing it with virtually no conventional advertising. They use social media to promote ongoing and special events and they have done a bit radio. Nonetheless, people flock to this place, starved for good beer and simple, tasty food. Guerber is optimistic about what they've accomplished and where the business is headed. "I knew from experience that it would take more time and money than I imagined to get this place going. But we've put together a good team and our hard work and patience is being rewarded. The future is bright." With all that said, now would be a great time for you to read the BeerAdvocate article. Careful, man...There's a Craft Beverage Here!